The Army and Navy Club's Book of the Month – August 2016! You'll be £30.00 closer to your next £10.00 credit when you purchase Nelson's Victory. What's this? May 2015 sees the 250th anniversary of the launch of HMS Victory, the ship that is so closely associated with Nelson and his great victory at Trafalgar and which, still extant, has today become the embodiment of the great Age of Sail. Many books have been written about Victory but none like this, which tells the full story of the ship since she first took to the waters in May 1765. It contains many surprises – that she was almost wrecked on her launch; that diplomacy conducted onboard her played a crucial role in provoking Napoleon's invasion of Russia in 1812; and that in 1914 Kaiser Wilhelm set the First World War in motion at a desk made from her timbers. The book also tells the story of Horatio Nelson, who was born a few weeks before his most famous ship was ordered, and whose career paralleled hers in many ways. It does not ignore the battle of Trafalgar, and indeed it offers new insights into the campaign which led up to it. But it says much more about the other lives of the ship, which at different times was a flagship, a fighting ship, a prison hospital ship, a training ship for officers and boys, a floating courtroom, a signal school in the early days of radio, tourist attraction and national icon. It looks at her through many eyes, including Queen Victoria, admirals, midshipmen and ordinary seamen, and Beatrix Potter who visited as a girl. It is simply a 'must-have' work for historians and enthusiasts, and a compelling new narrative for the general reader. his has to be the definitive history of HMS Victory, launched over 250 years ago at the Royal Dockyard at Chatham. It is most associated with Nelson and his victory at Trafalgar, yet the HMS Victory is as immortal as Nelson and has many tales of her own. Brian Lavery is a superb naval historian and a great storyteller, so any book he writes is a treat. Doubly so when it is a book produced in conjunction with Seaforth. The binding, printing, and beautiful illustrations make this a superb book from a visual as well as a literary point of view. Having served for more than twenty years on the advisory committee that looks after HMS Victory, Brian is very well placed to write a definitive book on this subject. Diplomacy conducted on board Victory played a crucial role in provoking Napoleon’s invasion of Russia in 1812. It’s also interesting to note that in 1914 Kaiser Wilhelm set the First World War in motion at a chest made of her timbers! Written in Brian Lavery's customary highly readable style, the book is clearly intended as much for the informed mainstream reader as for the true specialist. Numerous books, both technical and historical, have been written about Victory, but for an overall picture of the ship and her remarkable story this volume is hard to beat. ... Every naval professional and enthusiast will want to own a copy of this book, but the subject is such that a very much wider readership is promised. A book that does full honour to its twin subjects. As featured in Warships International Fleet Review this brilliantly high standard book, deliberately timed to coincide with the 210th anniversary of the Battle of Trafalgar, recounts the full story of Nelson and HMS Victory, fantastic details of her building and in depth construction diagrams as well as superb colour illustrations. This is a must read for anyone with a passion for maritime history. This exemplary work by Brian Lavery is a worthy addition to the library of work chronicling the warship. A welcome addition to one's maritime bookshelves. 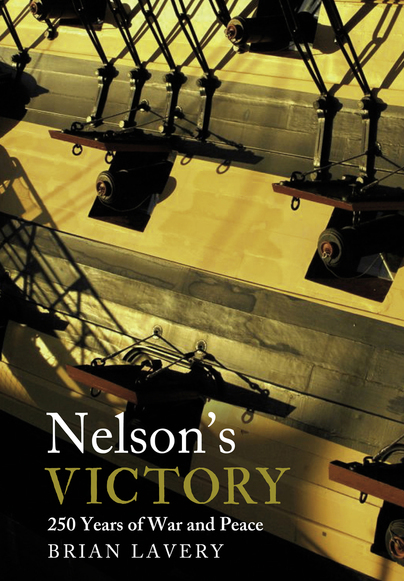 What makes Nelson’s Victory a valuable resource is that it is one of the few books examining her entire life in the water, from birth to present day. Most volumes focus on a specific period during those 250 years, such as when she was Nelson’s flagship or how events unfolded at the Battle of Trafalgar. Lavery, instead, discusses her life as a warship, a hospital ship, a venue to entertain or to hold a court-martial, a training ship, and a living museum. Efforts to preserve and protect her are also included. A bibliography, end notes, and index complete the book. As guest curator of the recent exhibition HMS Victory: The Untold Story at The Historic Dockyard Chatham and someone who has served for more than two decades on Victory’s advisory board, Lavery has a firm grasp of both who this ship was and the legendary and national symbol she has become. The many wonderful illustrations – portraits, artwork, maps, diagrams, and photographs –make Victory and Admiral Nelson real, while the primary quotations supplement and enrich the reader’s understanding of who they were/are and why they are important then and now. Even those who have read multiple illustrated works on these topics will delight in rare gems, such as the sketch showing the faces and names of some of Victory’s crew during Nelson’s command or the photograph of the full-scale model of the warship built for the Royal Navy Exhibition in 1891in Chelsea. This oversized, full-color treatise is well worth the cost and is a fitting memorial to the ship, her most famous admiral, and those who worked on her or sailed aboard her. The author has been involved with the team that look after the ship, and is the guest curator for the exhibition 'HMS Victory: The Untold Story' at the Historic Dockyard Chatham. His knowledge and affection for the ship shines through in this book, one which I have found quite fascinating to read. The old paintings and models that illustrate the book throughout, along with the modern day photos of the ship, even including a piece of timber and embedded cannon ball remaining from the Battle of Trafalgar, make for an excellent tribute to this our most famous Royal Navy ship. Beautifully illustrated in colour throughout, this is a 'must-have' book for members of the 1805 Club. The book deals in great detail with the Battle of Trafalgar and also with what could be regarded as the second most significant episode in her long career...It provides a valuable background to the often controversial issues involved in conserving and repairing such a large, complex and antique structure.